Sunwest Metals Inc. has been open to the public since 1981. 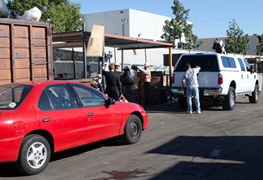 As one of the leading Orange County scrap disposal centers we are willing and ready to satisfy all of your recycling needs. We purchase all CRV materials as well as competitive pricing on all ferrous and non-ferrous metals. After weighing in your material(s) we settle up with cash on the spot and ensure to make the process as quick and easy as possible. Why have scrap laying around cluttering up your home or storage unit when you can turn it into cash? Give us a call today to get a current quote on your material. CRV stands for California Redemption Value or California Refund Value. The acronym is used for both and the two are related. California Redemption Value is a deposit Californians pay when purchasing bottled water, soft drinks, sports drinks, coffee, tea, beer, or other malt beverages packaged in aluminum, plastic, or glass. Cash registers are programmed to ring up the deposit separately from the cost of the beverage and it appears as a separate line item on your receipt. This mandatory deposit was imposed as an incentive to keep recyclable materials out of landfills and encourage recycling within the community. To reclaim this deposit you must bring in your used aluminum, plastic, or glass bottles to a local recycling center. Sunwest Metals Inc. is just the place to reclaim this deposit and help the environment in the process.